As Tesla’s Model 3 gets closer to the open roads, we’re interested to see what how the much-ballyhooed electric car can transform the roads in practice. Tesla still hasn’t given full specifications on the Model 3, but there are several things we do know about the electric apple of Tesla’s eye. Here are the things you should probably know, too. According to Tesla’s own mission statement, it plans to make an expensive electric car to fund a cheaper electric car to fund an even cheaper etc. The Model 3 appears to be the realization of that. At a pre-order price of $35,000, it’s considerably cheaper than the Model S (starting price for me being about $70,000) or Model X (about $83,000). Keep in mind, as a Texan I only have the standard $7,500 income tax incentive. Depending on where you live, you might have an even better tax break. Tesla announced last year that every buyer who preordered a Model 3 after January 1, 2017 would have to pay fees to Supercharge their car. You’d be granted a small stipend of free miles, but beyond that, you’ll have to pay to use the Supercharger station network Tesla has so busily augmented recently. Tesla was quick to remind everyone that it will still cost less to Supercharge than it would be to fill the tank of a traditional combustion engine car. Elon Musk confirmed on Twitter that a retractable hard top-like solar panel might be an option for the Model 3. I’ll believe that when I see it, and Musk doesn’t say whether the panel would charge the battery or power smaller tech in the car. If it’s the former, it could mean less time spent at the aforementioned Supercharge stations. If I get my hands on the electric car of the future, camping out in it might not be my first inclination. But Tesla is apparently ready to accommodate that need, as the Model 3 is rumored to have the same Camper Mode as the Model S: you’ll be able to put the back seats down, which turns your car in to a five-and-a-half foot long bed. It hasn’t been officially confirmed, though a source familiar with the project gave Bloomberg the size. I’m not saying this was designed with Silicon Valley’s economically-disadvantaged tech workers in mind. I’m just saying, if housing costs there rise any more, you might see fields of Model 3s in Camper Mode in the next few years. And lest the Model 3 is sounding too tame, don’t worry — it’ll come with Tesla’s signature Ludicrous Mode. That’s straight from Musk himself. Ludicrous Mode transforms the Model S into its evolved form, essentially, as it can go from 0 – 60 mph in 2.6 seconds. We’ll see if the Model 3 has the same kind of power. 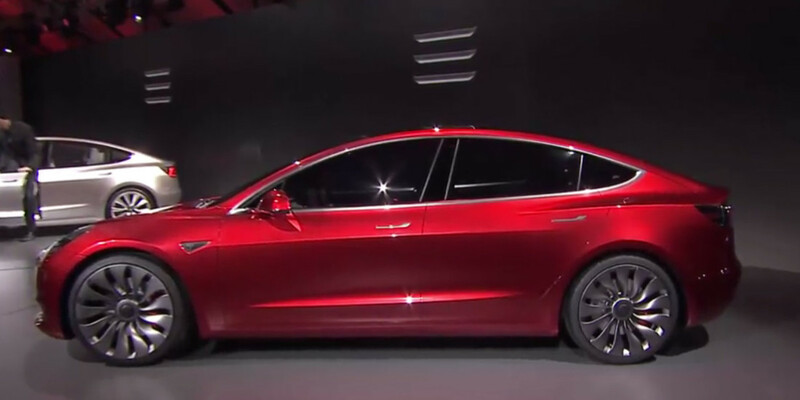 The Model 3 currently has a rated acceleration of 0-60 in 5.6 seconds — we don’t know if that’s in Ludicrous Mode or if its true speed is still to be seen. Personally, I’d get on the nearest straight road and find out the fast way the moment I get behind the wheel. Musk will be hosting an event tonight which will ship the first 30 Model 3s to their lucky owners. You’ll be able to watch the event on livestream. The company has been optimistic about its manufacturing — or at least Musk has, tweeting that the company should be able to manufacture 20,000 cars per month by December this year. Enthusiasts who reserved a Model 3 with a $1,000 deposit have not had much news from the company since last year, according to Bloomberg. Some aren’t happy about the wait, but are hopeful the company will reveal more at the launch event. The trouble is, even if Musk is on the money with regards to the manufacturing time, the company still has to make enough units to fulfill 400,000 pre-orders. That means it’s very likely the earliest most existing pre-orders will be fulfilled is some time next year. And if you didn’t pre-order one … I dare not even guess when you’ll see one. Are you ready for the Model 3? Were you one of the pre-orders? Let us know how you’re feeling about Tesla’s lightning machine.